Korean with listening is another SAT subject test that you can give. Majority of the students giving the Korean subject test actually speak Korean language. If you want to learn or have the desire for Korean language then you can take the exam. However you must know one thing that average score for Korean is quite high compared to other languages. As most of the students giving Korean subject test have Korean as their mother tongue, it naturally becomes easy for them to score good marks. Korean with Listening average score for SAT is around 767. You have to study day and night for Korean if you want to be even near to that score. You need to have perfect study material which can teach you Korean very well. You should also practice questions from practice sets to know about the level of questions and pattern being asked in the real exam. Not so many books are available in the market. We present you the only book being purchased by others. 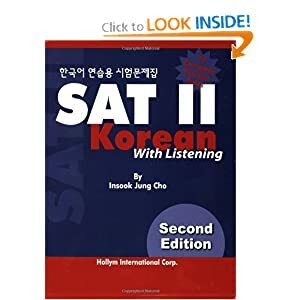 It’s the most popular language for taking SAT II Korean with listening paper. It has close to 5 star rating which suggest that the contents of this book are really good for the test. 10 complete practice tests and listening CD included. The intention of this book is to assist students studying for the SAT II Korean test, as well as help solve the problem of deficient materials for Korean language instructors. In addition, this text is targeted not only for 2nd generation Korean-American students, but also for other American students who desire to study Korean seriously. This book is written as test preparation material for students who have studied Korean for over two years in both public or private middle and high schools in the United States. This also includes students who have attended weekend Korean schools for 5-10 years. You can purchase the book from amazon and start your preparation. There is a chance that Korean with listening may not be available on all exam dates hence you need to check college boards website and register for SAT II Korean with listening on proper date. You can also practice questions on college boards website to get acquainted with the pattern of the exam. Normally it’s a one hour exam containing around 90 questions on various topics. Best of luck to everyone who are going to give SAT II Korean with Listening this year. This entry was posted in SAT II Korean Prep Books, SAT Subject Test Books, Uncategorized and tagged Best Prep Books for Korean with Listening SAT II Test, Prep Books for SAT II Korean Subject, Study Guides for SAT II Korean Test, Study Material for SAT II Korean Subejct Test, Top Books for Korean with Listening Test on June 20, 2014 by satyenhacks.